Alsco Locker Systems make the life of your employees much easier. They provide enough space to store uniforms and other items safely and are made out of sturdy and durable material that is easily cleaned and maintained. This laundry locker comes with 6 hanging doors, providing ample space for storage. 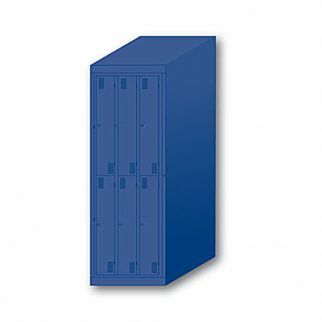 Its infill panels are made of durable steel that fills the gap between lockers and walls. Increase hygienic levels at your workplace with these convenient lockers. No dust settling due to carefully sloped tops. Conveniently designed to ease cleaning due to plinths off the floor and flush end panels. To get started, simply telephone our friendly customer service representatives for New Zealand on 0800 4 ALSCO or complete the online enquiry form.